"I just want to stand here and cry. They're so beautiful," Beverly Kingdon says. She's talking about the the hundreds of majestic trumpeter swans — the largest swan in the world — who have come to winter in LaSalle Park in Burlington, Ont. Their presence here is something of a miracle. A century ago, trumpeter swans were all but extinct in Canada. Retired biologist Harry Lumsden has spent the last 40 years working to bring North America's biggest waterfowl back from the brink. This winter — which is the bird's mating season — Lumsden estimates there are around 1,200 trumpeter swans in Ontario. "I don't think I expected anything this successful," says Kingdon, who has worked alongside Lumsden since the beginning of the swan restoration project. 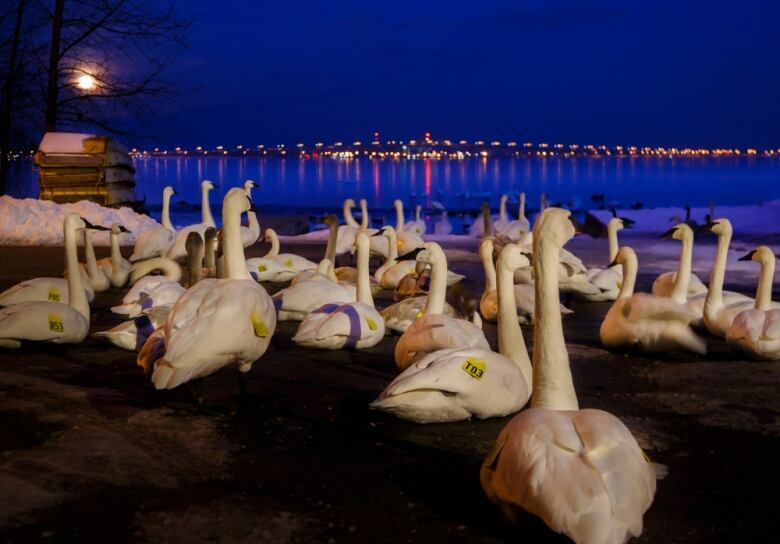 These swans — one quarter of the province's trumpeter population — return to LaSalle Park Harbour every winter. Kingdon, Lumsden and other volunteers with the Trumpeter Swan Restoration Group continue to protect, monitor, and advocate for the species. "Marvelous, dramatic bird; they're part of our heritage. This was an iconic species, and it was important to bring this bird back so that everyone could enjoy it," said Lumsden. Like the dozens of other species that have ceased to exist in Canada, the trumpeter's population first began to dwindle in the 1800s. "There were hundreds of thousands of them, and then they were hunted. 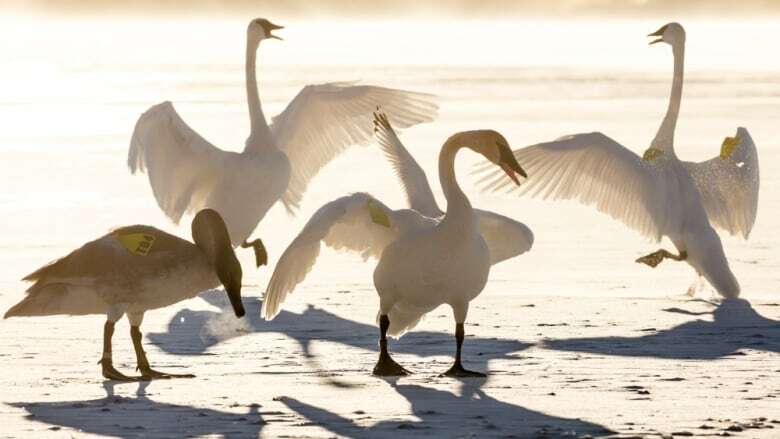 And they were hunted for their meat, they were hunted for their feathers, they were even hunted for the leather on their feet," said Liz Benneian, spokesperson for the Trumpeter Swan Coalition. Lumsden's restoration journey began when he received a shipment of trumpeter swan eggs in 1982. The Trumpeter Swan Restoration Group was started. The Wye Marsh near Midland, Ont., began a captive breeding program. Dozens of volunteers got involved. The eggs hatched. The cygnets, or young swans, needed to be raised and closely monitored. Volunteers spent hours ensuring that the birds were both trackable and identifiable. They still do. Each bird gets a band with a tag number, as well as a first name. Volunteers map their family trees — and love lives. "It's nice to see so many now. They can now go on expanding. They've got a long way to go," said Lumsden, who is retired from the Ontario Ministry of Natural Resources but continues to champion the trumpeters. "There are still some challenges facing the birds and there's very high mortality rate. Before they reach sexual maturity we lose about 60 percent of them," said Sara Handrigan, who volunteers with the trumpeters. Lead poisoning plays a significant role. 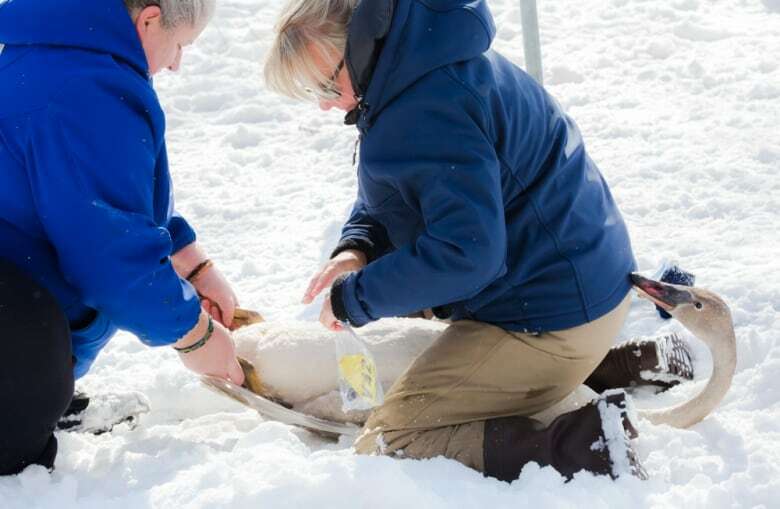 It only takes accidentally eating one lead pellet or fishing sinker to kill a trumpeter swan. Power lines, poaching, and hunting mistakes are also threats. Despite the challenges facing the trumpeter swan, Benneian wants to focus on the good. "We need to celebrate these conservation success stories, because so often when we think about environmental problems we think they're insurmountable. In a lot of ways we lose hope; we've buried our head in the sand about the very real environmental issues that exist in the world because we don't think we can do anything," she said. "Well, here's a story that shows we can do something and that if you give nature just a little bit of help — the tiniest little bit of help — it's resilient. It will bounce back." The annual winter sojourn at LaSalle Park Harbour is a time of celebration for swan lovers. Between mid-February and the end of March, the trumpeters begin to head out for their summer homes. "When they leave in the spring I don't always know where they're going. I don't know if I'll ever see them again," Kingdon said. But when the swans do return, "It becomes like a little reunion down here all winter — a village of swans and a village of people." Click 'listen' above to hear the documentary. What is the 'moral authority to govern' — and how does a government lose it?